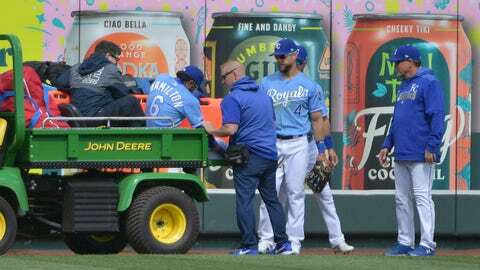 Center fielder Billy Hamilton is helped into a cart after getting injured trying to catch a potential game-ending fly ball. Kansas City has lost 10 straight games, has the worst record in the big leagues at 2-10 and is off to its worst 12-game start since 2006. The Royals failed to preserve leads of 4-0 in the sixth and 6-4 with two outs in the ninth. Brandon Brennan (1-0) struck out three in the ninth, working around his own throwing error on a grounder to get his first big-league win. Brennan has not allowed a run in his first 9 2/3 innings in the major leagues, holding batters to a .156 average (5 for 32). Pinch-hitter Omar Narváez and Gordon singled off Brad Boxberger with one out in the ninth and Mallex Smith took a called third strike. Haniger hit a long drive on a full count and Hamilton, who had entered at the start of the half-inning as a defensive replacement, gave chase but the ball glanced off his glove on the warning track. Haniger, who hit a tiebreaking homer with two outs in the ninth inning Wednesday, slid into third as two runs scored. Hamilton’s left knee hit the wall, and he crumpled to the warning track, then was unable to put weight on the knee when he got up. He left the field on a cart. Royals RHP Jake Newberry was recalled from Omaha, and 1B Frank Schwindel was optioned to the Triple-A team. Mariners: OF Jay Bruce was held out of the lineup with a sore left Achilles. He came out of Wednesday’s game after the third inning because of the injury. … RHP Shawn Armstrong pitched an inning Wednesday night on an injury rehabilitation assignment for Triple-A Tacoma. He is on the 10-day IL with a right oblique strain.